Benjamin Netanyahu’s bad day Thursday got off to the worst possible start: before the Israeli general prosecutor Avichai Mandelblit officially called for the indictment of the Israeli prime minister for corruption, the UN accused him of much more serious crimes. He stood accused of war crimes and crimes against humanity, which, according to the UN, Israel has been shamefully perpetrating in the Gaza Strip over the past year. 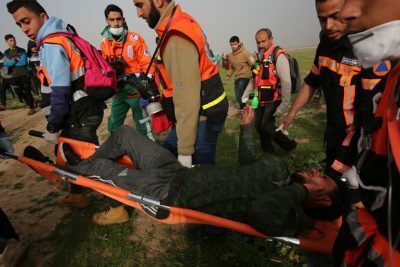 This was the result of the investigation by the Independent Commission of Inquiry established by the UN Human Rights Council, tasked with examining what has been happening on the border lines between Gaza and Israel for almost a full year: namely, Israel’s repression of the Great March of Return, the initiative launched on March 30, 2018, to demand the right of return for Palestinian refugees (in accordance with UN Resolution 194/1948), and to call for an end to the Israeli siege of the region, which has been ongoing for the past 12 years. According to the UN investigation, the indiscriminate fire aimed at unarmed civilians by Israeli snipers “may constitute war crimes or crimes against humanity.” The death toll has been devastating: more than 250 killed (including 48 children) and more than 26,000 injured, with many permanently disabled, compounded by the fact of being in Gaza, where the health system is already in a state of collapse because of the state of siege and the lack of drugs and electricity. Here, people have to live with just two to four hours of electricity a day. Furthermore, the Commission (whose report was compiled based on interviews, video evidence, medical records and drone footage dating from up to Dec. 31) is in possession of the names of those who are responsible: of the snipers who actually killed people, and of the generals who immediately adopted the barbaric “shoot to kill” policy (on orders from Tel Aviv). The Commission “found reasonable grounds to believe that Israeli snipers shot at journalists, health workers, children and persons with disabilities, knowing they were clearly recognizable as such.” Israeli soldiers “have intentionally shot children, they intentionally shot people with disabilities, they intentionally shot journalists,” said Sara Hossaini, a member of the Commission, at a press conference in Geneva. “No one can deny Israel the right of self-defense,” said interim Foreign Minister Katz, pushing the longstanding Israeli narrative of the past year regarding the “threat” supposedly represented by unarmed civilians hundreds of meters away from soldiers, civilians or Israeli infrastructure.